Family & friends are invited to attend Visiting Hours on Tuesday, March 19th in the Vertuccio & Smith, Home for Funerals, 773 Broadway (Rte. 107) REVERE, from 9:00 a.m. to 11:00 a.m., for Marie B. (Oliver) Doherty, who passed following a lengthy illness on Thursday, March 14th at Phillips Manor Nursing Home of Lynn. Her Funeral Service will follow the visitation in the funeral home at 11 :15 a.m. and entombment will follow immediately at Woodlawn Community Mausoleum (The Versailles Bldg.) Everett. Born, raised & educated in Revere Schools, she was a 1942 alumna of Revere High School. 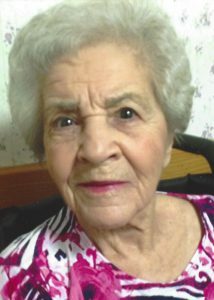 Marie lived in Revere for 79 years before moving to Brooksby Village in 2004. Most of her life, she was blessed with an intrinsic ability as a master seamstress and fashion designer. All of her family, extended family & associates saw Marie as the go-to person when they were in need for a minor alteration up to & including a total wedding ensemble. Her designs were authentic and detail perfect. Many of her nieces & nephews enjoy relating stories of a special party, a wedding, a first holy communion celebration, etc. with Auntie Marie’s part in the event. For many years, Marie was a member of the Revere Women’s Club. She was the beloved wife of the late, Revere Firefighter, John J. “Chickie” Doherty, Sr., who passed in 2004. She is the cherished mother to John J. Doherty, Jr. & his wife, Diane of Tarpon Springs, Florida, Donna M. Marotta & her husband, Alfred J. of Saugus, Doreen P. Carolan of Revere & the late, Revere Fire Chief, Daniel J. Doherty and his surviving wife Marjorie A. of Danvers. She was the dear sister to the late Elizabeth “Betty” Steritti, Patricia Frye & her late husband, Warren & Cosmo “Billy” Oliver. She is also lovingly survived by nine 9 grandchildren, 13 great-grandchildren & her sister-in-law, Eleanor Oliver of Melrose and her brother-in-law, Retired Revere Deputy Fire Chief, Vincent “James” Steritti of Nahant. She is also survived by her former son-in-Iaw, Frank Carolan of Palmetto, Florida. Tuesday, March 19th from 9:00 a.m. to 11:00 a.m. In lieu of flowers, remembrances may be made to the Frontal Temporal Brain Disorders Unit at Massachusetts General Hospital, Boston by visiting www.ftld-boston.org. I was so very sorry to hear of your Mom’s passing. She was always such a nice lady. We had lots of fun on Central Ave when we were kids! Lots of summers in the Doherty pool! Your Mom made all of my bridesmaid’s gowns for my wedding and was a perfectionist! They all looked beautiful! I was truly saddened to see this today. I didn’t know. I’m so sorry about Marie’s passing. My family always had a wonderful time at the Doherty’s house. Many, many memories. My thoughts and prayers are with you all. Marie is finally “home” with her beloved Chickie.